Tool specialist KS Tools has a new pneumatic spring compressor station in its product range which facilitates the changing of spring and shock absorber struts substantially. Ultimately there are enormous forces at work when compressing the spring through which considerable potential danger is also generated. The new spring compressor can be used universally and offers the biggest vehicle coverage on the market. 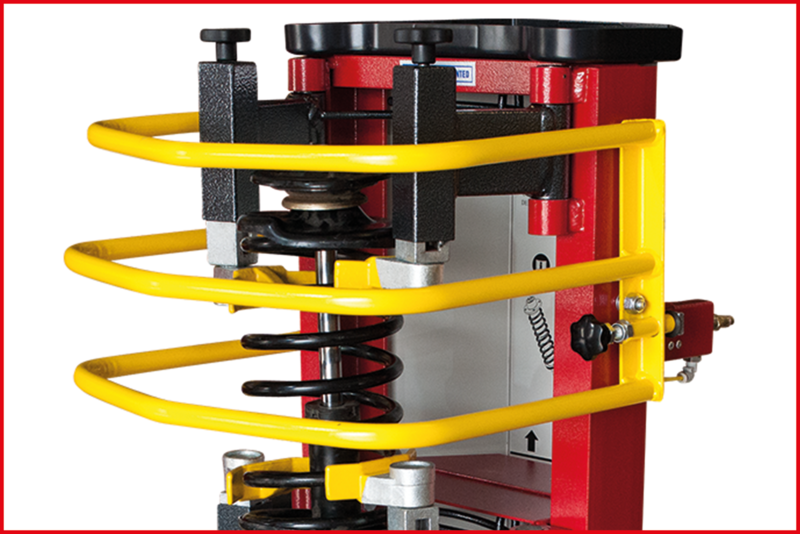 The stationary pneumatic spring compressor is also able to compress „banana“ springs so that they don‘t bend during the compressing procedure. This lets the mechanic insert the shock absorber strut back into the spring without problems. The equipment can safely be operated by one person as control is by means of a foot pedal. During the compressing procedure the mechanic‘s hands are thus outside of the danger area. The KS Tools product number is 500.8805. These days if the car mechanic wants to change the springs and/or shock absorbers on modern vehicles he is to some extend confronted with big problems due to the many different types and shapes of spring. This is where only a professional tool helps: the pneumatic spring compressor from KS Tools. The convenient pneumatic operation is by means of a twin foot pedal. In this way the mechanic can compress or release springs without danger and exertion. Even springs with few coils (for example on BMW or Mercedes) where the strut bearing has to be compressed with it, or springs with low coil spacing, can be compressed without difficulty using the equipment. Because it comes from KS Tools complete including a special accessory adapter for such springs. According to the manufacturer, no further, expensive adapters are therefore needed. The robust safety cage with microswitch safeguards the user against injury when working with the equipment. It ensures that the spring compressor only functions with the cage closed thus preventing the spring from „flying out“ in an uncontrolled manner. 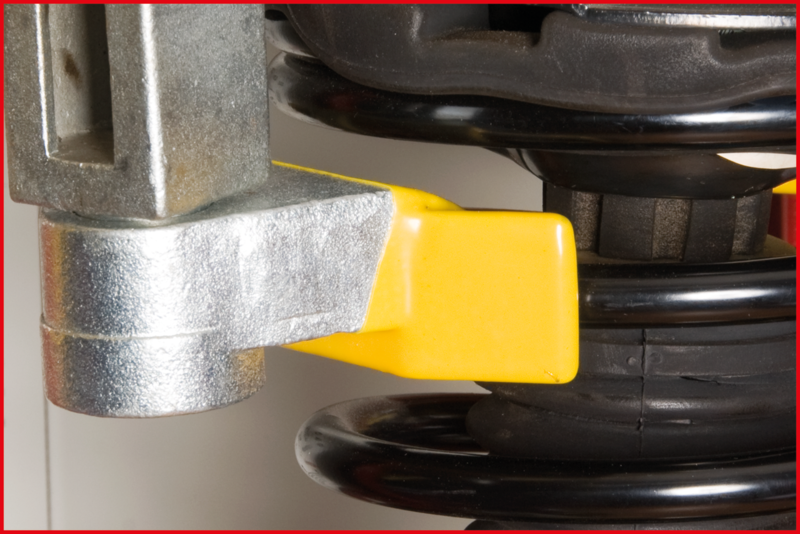 A swivelling plate further prevents the dismantled shock absorber from falling. So neither the spring nor the mechanic are damaged or injured. Because the spring is operated by foot, the fitter‘s hands remain free and outside the danger area. The basic equipment, together with the pneumatic cylinder supplied, is suitable for over 95 percent of the springs in the market. It is designed for forces of up to 24,000 newtons. The pneumatic cylinder has a maximum force of 12,000 newtons. For those who need even more power for a few special applications then a second pneumatic cylinder can be retrofitted as an option which increases the compression force to 24,000 newtons. Because, however, the 12,000 newtons of the cylinder supplied is sufficient for the majority of vehicles, KS Tools has decided not to supply the additional cylinder as standard. Thus the practical, everyday equipment remains affordable. The spring compressor can also compress banana or KMP springs without them bending during the compressing procedure. So the shock absorber strut is particularly easy to insert back into the compressed spring. This is possible because only with this special spring compressor can all four compression jaws be adjusted separately in height. This makes the equipment suitable for (amongst others) the Citroen C2 and C3 models as well as Peugeot 207 and 307 or Renault Megane and Clio which are fitted with banana springs. A stand is available as an optional extra for the spring compressor which increases the height of the structure by 30 centimetres thus enabling work to be carried out at eye level. The professional car mechanic can also purchase additional wheels for ease of transport within the workshop. 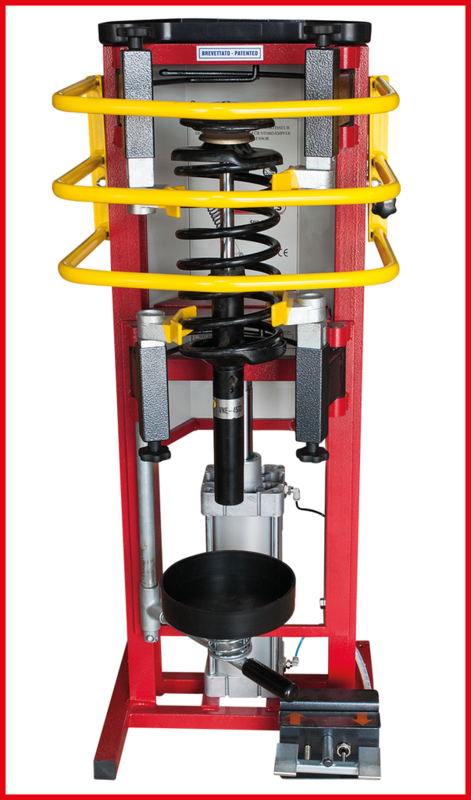 The compressed air spring compressor is suitable for the following types of spring: standard springs, right and left hand coiled springs, force centre orientated springs (KMP or „banana“ springs), conical springs / barrel springs, springs with low coil spacing, springs with low number of coils, springs with large or irregular coil pitch.